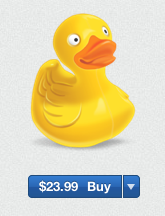 I use an excellent free Open Source FTP client for the Mac called Cyberduck. It is available on their website for free, but I have donated to the project. On a whim, I searched for it in the Mac App Store, and there it was… for $23.99. Interestingly enough, the link to the App Store from their website did not work for me. Is this a rip off? Or is this a way of taking advantage of less technically savvy App Store users?